I usually try not to make too many desserts from Pinterest. Desserts on Pinterest look delicious but they often have WAY too much butter, sugar, fat, and calories. These chocolate peanut butter bars are certainly no exception. They have their fair share (and more!) of butter, sugar, and calories, but sometimes the sweet tooth kicks in and I've got to have something sweet and yummy! I'm sure I've mentioned before how much I love chocolate and peanut butter. So it's no surprise that one of my favorite candies is Reese's peanut butter cups and these chocolate peanut butter bars taste just like them! The nice thing about Reese's peanut butter cups is that only two pieces come in a package so there's some kind of portion control built in. This recipe makes a whole pan! You've got to use some serious will power not to eat them all! I tried to help myself by cutting the recipe in half and only making half a portion. Looking back at the recipe, I realize I missed a step and I didn't melt the chocolate and peanut butter together for the chocolate topping. I just put melted chocolate on top which would explain why it was a little tricky to cut. Hmmm . . . I may have to make them again! Yeah, these chocolate peanut butter bars taste great, but here's some more reasons to love 'em: no baking required and only five ingredients needed. Get the recipe here. 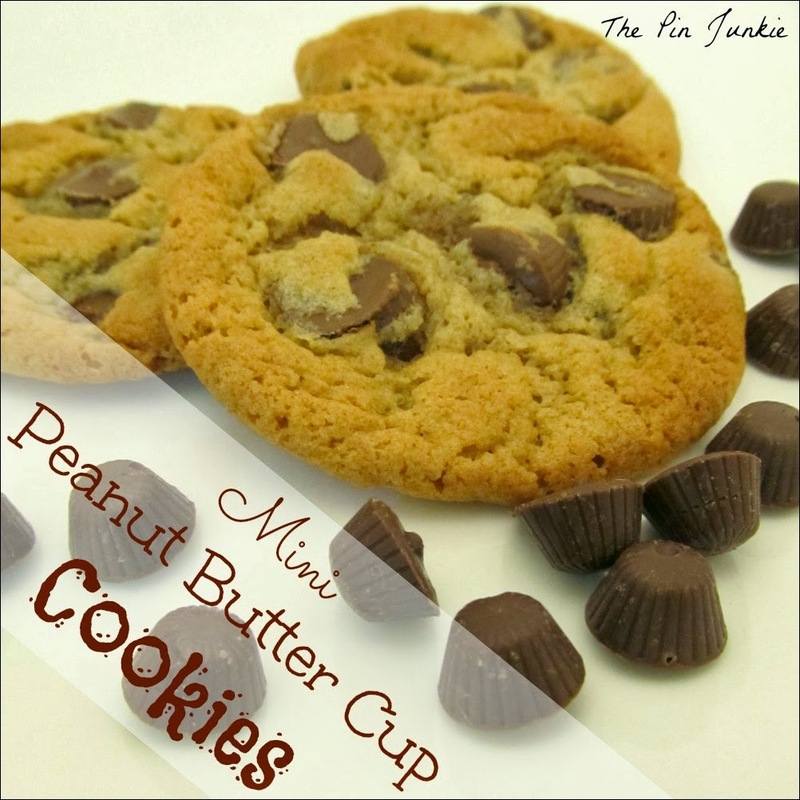 Find more chocolate and peanut butter recipes in the recipe index! 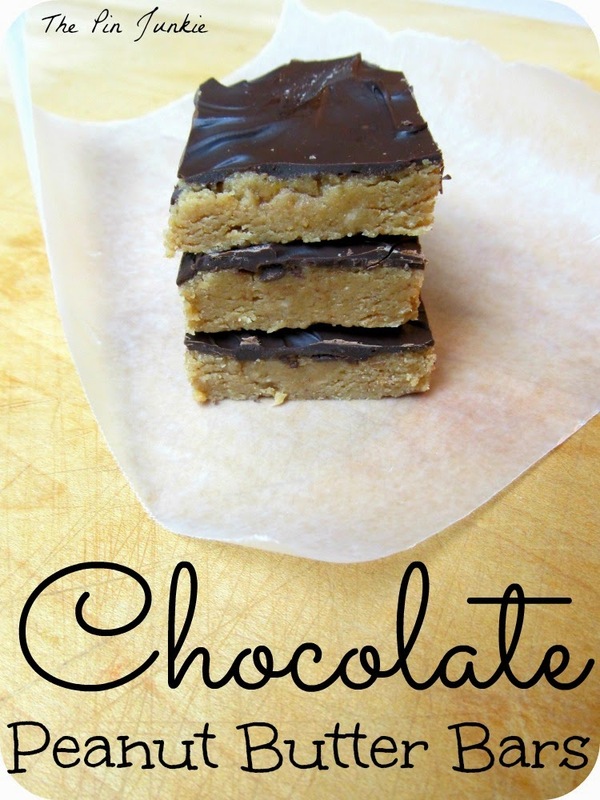 Inspired by this pin for chocolate peanut butter bars. All I'm missing is a bag of chocolate chips! Picking some up soon and making this. YUM!!! These remind me of a childhood favorite they'd make in school! YUM! I've pinned and shared it! I agree with you 100% Karen! Yummy! I love peanut butter and chocolate together! Thanks for sharing on the Titus 2 Tuesday link party. These look delicious! Pinned it! Can't wait to try them! Love Peanut Butter and Chocolate ...Yum!! Thanks for sharing. I'm pinning it. I must be craving peanut butter, I keep checking out pb recipes! Oh I love the no bake part! Yum! 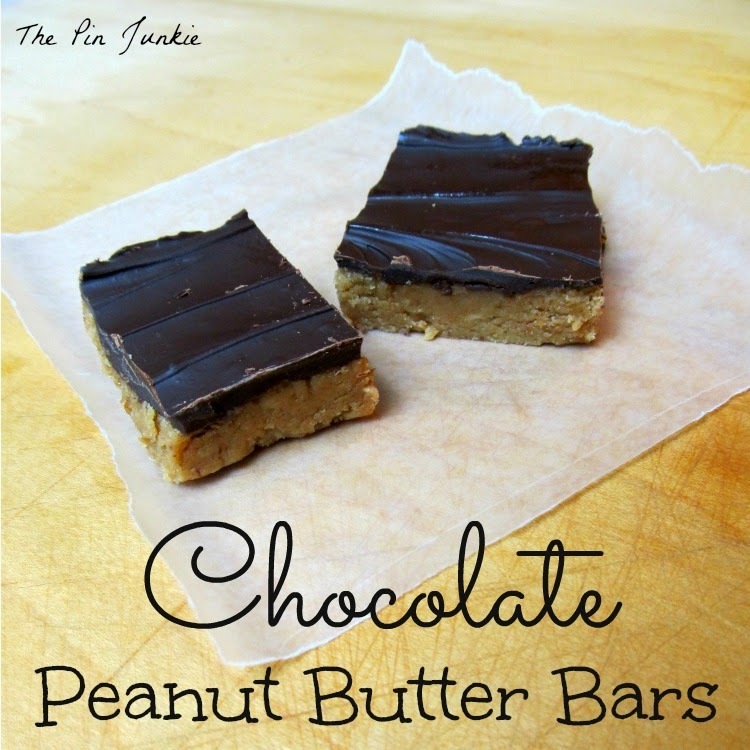 You cannot go wrong with chocolate and peanut butter - love that combination! Pinning these for sure! Visiting from LOBS! 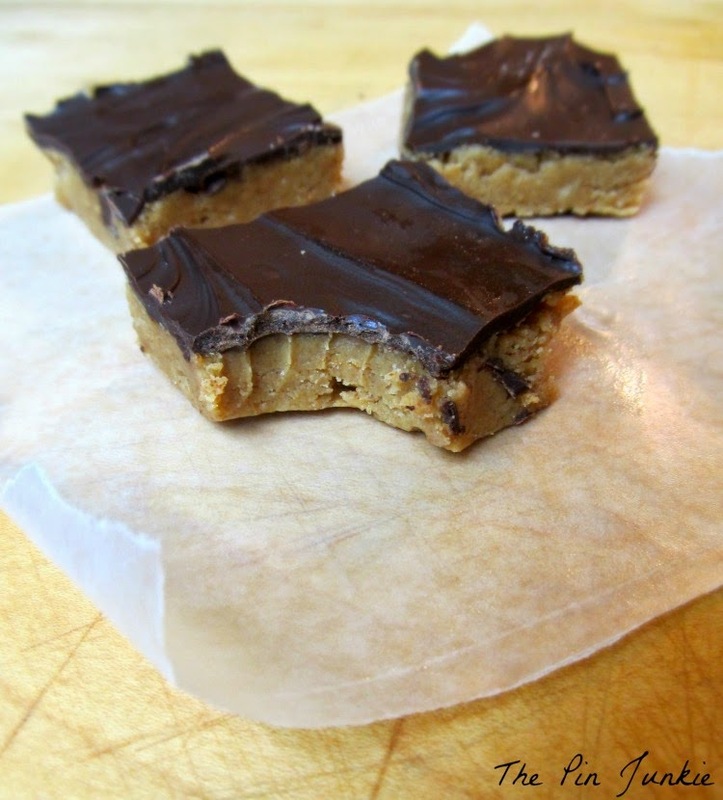 Peanut butter bars are one of our families favorites. Because I am not a huge chocolate lover I frost them with a very light milk chocolate frosting. Chocolate lovers would die for these! Thanks for sharing with SYC. I love chocolate and peanut butter ... this looks so dangerous! I love these! Chocolate and peanut butter are always a great combination! I am featuring your recipe tomorrow on Tasty Tuesday! Thank you for linking up with us! Please stop by tomorrow and grab a featured button and link up again! Thanks for the feature Julia! These look so good. I just pinned. Thanks so much for sharing with Adorned From Above's Link Party. MMm - chocolate and peanut butter - best combination! Thanks for linking up at Take it on Tuesday! The only thing better than peanut butter and chocolate is chocolate and peanut butter! These look delish. I am featuring them when my link party opens up tonight! I agree! Thanks for the feature Carol. I appreciate it!